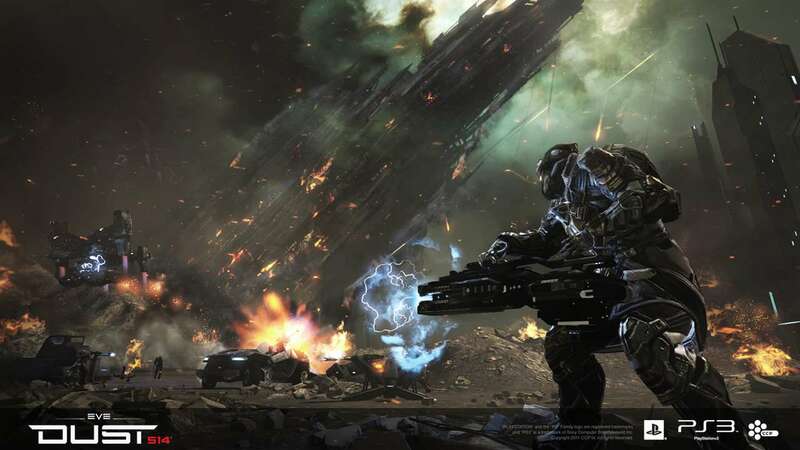 Here on Crossing Zebras, we have talked extensively about our fears for Dust 514 and whether it can stand tall in face of competition from the likes of Planetside 2, Call of Duty and Battlefield. It appears that we aren’t the only people thinking the same thing. One of the most senior members of Goonswarm Federation’s Dust 514 wing, Goonfeet (and coincidentally, one of the best people to follow on twitter) has written a guest blog telling us why he thinks Dust 514 is doomed to failure. Announced in the Summer of 2009, CCP abruptly revealed a new product in development called “DUST 514.” Proclaimed as a Sci-Fi shooter that not only took place in New Eden but also heavily interacted with it. I’m not entirely sure what had perked my interest. I had never been anything more than a casual FPS player, and I certainly wasn’t that big into consoles. Perhaps it was because I was a big EVE player. Maybe I was looking for something different. Regardless, Dust had definitely caught my attention and before I knew it I was hooked in the hype. Four years later, I wish they had just scrapped the entire project altogether. Developed in an era of CCP’s “wouldn’t it be cool if…” attitude, I look at the game now and wonder how they spent those four years building such an unimpressive product. Maybe they were too preoccupied asking themselves if they could do it that they never bothered to ask if they should. EVE Online survived because there really wasn’t a direct competitor that threatened its existence. Dust has several, and all of them have far better name recognition and have a history with more polished titles. When the exclusivity deal with Sony was announced, there were obvious concerns to everyone. No PC client meant that many EVE players would not be able to participate. The longevity of the PS3 was also an issue. Finally, the development of a very similar product in Planetside 2 meant that CCP would not be allowed to halfass it. Unfortunately for them, the product they delivered was underwhelming. It was funny reading the reviews at launch. Almost all the positive reviews highlighted the potential of the game, not the actual state of the game itself. Others regurgitated things the CCP Chief marketing Officer David Reid had sold people at the last two Fanfests. The mediocre and bad reviews almost unanimously slammed the current state of the game. The key feature at the release of Dust was Planetary Conquest. One month later, several of the major groups involved with it have announced they’ve pulled out or will not defend the districts they’ve taken. PC, in a nutshell, took the worst aspect of EVE (structure grinding) and made it their key feature. District battles are under a timer system, and will almost always take anywhere from a few days to a week to capture, even if unopposed. Battles are often against the same people every time, and alliances with hundreds of players will often only have small groups who actually take part in it, a bad side effect of the limited 16 vs. 16 matches. Even if you have a small number of districts, the amount of timers you will face to defend it can be overwhelming. Benefits of owning a district are very minimal. The biggest incentive is the ISK your corporation gains passively by selling excessive clones to a NPC corporation. Because there is no mechanic to set a corporate tax rate, the only other way for a corp to survive is to live off donations. The other benefit is having the ability to have corporation battles with other groups at very low expense. The only reason this is a benefit is because they completely removed the corporate battle system in Uprising, so if you don’t own any districts you’re out of luck unless you want to buy a clone starter pack (80 million ISK each) and pray to god you can take a district with it. 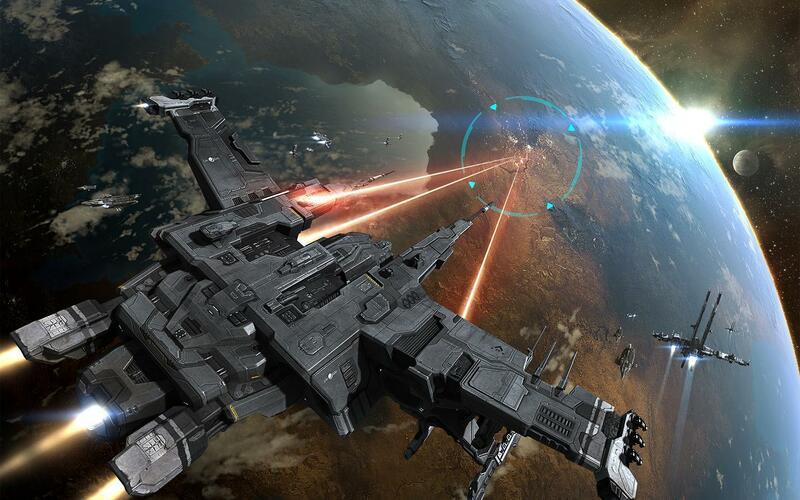 The other key feature that was sold directly to the EVE Online audience was the ability for EVE ships to orbital bombard planets. When the feature was first revealed at FanFest 2012, there was a lot of excitement. It looked and felt cool. A year later the orbital bombardment mechanic has been watered down; there are no launch codes and you’re limited to both the class of ship and waiting for ground teams to accumulate a certain amount of warpoints before you can launch a strike. The novelty wore off very quickly, and the interest EVE-side plummeted. Again, another key feature that needs serious iteration after being shipped. There are numerous core problems with the game. The game itself does not look that great, and the graphical lag at anything but the lowest settings is huge drain on system resources. These problems might be directly tied to the limited hardware capability of the PS3, but that’s also on CCP’s shoulders for delivering a product that doesn’t play well. Bullets don’t fly past their max range, if a player is outside of the maximum range of a weapon by even one centimeter, not a single bullet will hit your target. Having to reset your PS3 after a couple of quick fights just so your system won’t freeze in battle and cost you valuable equipment is a necessity. Voice comms are shaky and low quality, which at times can make coordinating with your teammates difficult. EVE avoids the ‘grinding EXP’ by having an entirely passive skill point system. Dust only partially has passive SP, and the weekly active cap means that if you’re not grinding your maximum each week you’ll quickly fall behind. To deal with this, players will often just AFK in the MCC and contribute nothing to a match. This in turn causes public matches to be usually decided by which group has less AFKers. CCP was warned repeatedly in the closed and open betas that the grindy nature of the game was a huge problem, yet did nothing about it. Balance between the various classes and weapon systems is still a big deal. For instance, the top Caldari Logistics Suit serves as a better assault suit than the top Caldari Assault suit. Weapons are either overpowered or generally useless. Sniping from safezones that the enemy cannot get to is also another problem. Friendly fire, a mechanic that allows you to intentionally or unintentionally hurt or kill teammates, is turned off in every mode with the exception of Planetary Conquest. In a universe that brags about how cruel and unrestricting it can be, it’s silly to watch an orbital strike land within meters of you and not instantly kill or damage you in the slightest. CCP likes to brag that EVE is real and that every action has a consequence. In Dust, that could not be further from the truth. Documentation for the game is near non-existent in any official capacity. This is also a problem with EVE. All of the documentation for EVE was almost exclusively written by the customers, and Dust is no different. EVE University, Goonswarm Federation, and Test Alliance Please Ignore, three of the most well known and successful EVE groups, all have their own self-written documentation to get players familiar with the game. Forcing a similar system with DUST is a critical mistake and just adds confusion to an already unpleasant experience. The newbie tutorial in Dust is a series of matches against other new players, with no explanations for why things are happening or what to do. A common problem with the newbie academy is established players creating throwaway accounts to farm new players. There have been a lot of complaints within the Dust community that the links to EVE need to be drastically expanded in order to attract more players. I disagree wholeheartedly. The game itself will never sustain a community if there aren’t drastic improvements to even the most basic gameplay. The links will be meaningless if game itself is terrible, and developing it on both games will be entirely wasted if either game is suffering. EVE is in a pretty healthy state; DUST is on life support. Forcing interactions between the two when one game is in trouble is a disservice to the other. CCP’s customer service has been appalling for years. Petitions in EVE can sometimes go unanswered for weeks, and Dust is no different. Because of changes to the skill tree players were offered a respecialization if they filed petitions. A month later, many of them still have not received them which has severely limited their builds and many have left in frustration. Even worse, several players have reported that their accounts were reset completely, with all SP and ISK set to the default amounts. When a bug gave out a bunch of free ISK to many players, CCP removed the ISK several days later. This left many with a negative balance and only the petition system to get out of the hole. With all of the faults of the game, there are a few things I do like. The simpler and easier to use starmap is superior to EVE’s, I hope one day they add a modified version for the EVE client. Pay-to-win is generally not an issue, with the notable exception of the skillpoint bonuses. All armors, weapons, modules, and vehicles have an ISK counterpart and are generally not that difficult to keep stocked unless you’re throwing them away in meaningless public matches. The CCP staff have been available for discussion on twitter (particularly CCP Nullarbor and CCP Fox Four) and usually get back to you within a reasonable amount of time. With the probable failure of Dust, I now look at World of Darkness and wonder if that’ll flop in similar nature. Two disastrous products in a row is bad for any company; especially for a medium-sized entity like CCP. Can they survive two duds in a row?